On June 27, the Los Angeles City Council unanimously voted to divest $40 million from the city’s security investment portfolio with Wells Fargo. After four months of persistent public pressure from Divest LA, Indigenous Peoples, and supporters insisting upon the creation of new ethical banking standards and practices, the City of Los Angeles took a step forward - joining other major metropolitan cities across the United States by divesting from Wells Fargo, a financial institution known for its legacy of harming citizens, the environment, and people of color. 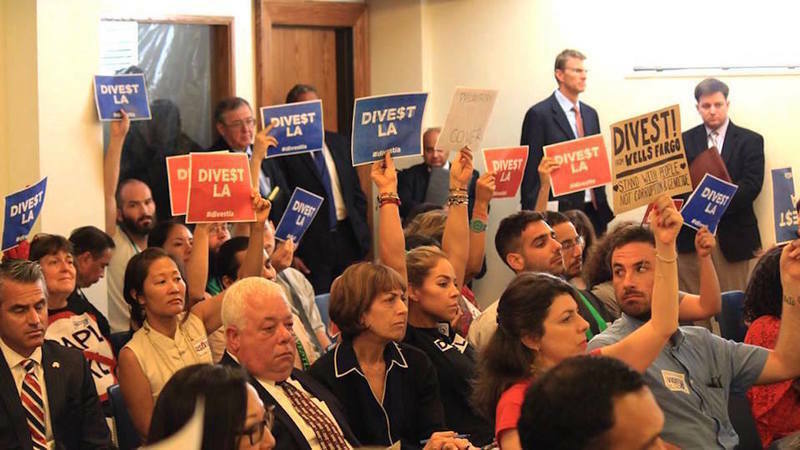 CPD affiliate, ACCE, played a key role as part of the Divest LA coalition. The initial divestment of $40 million is an important first step in untangling the business relationship between the City of Los Angeles and Wells Fargo. Wells Fargo's most recent notorious and unethical business practices include opening millions of fraudulent bank accounts, engaging in predatory lending practices, and financing destructive non-renewable energy projects, which includes funding a significant portion of Energy Transfer Partner's Dakota Access Pipeline. We believe that today’s unanimous vote by all Los Angeles city council members sends a clear message to Wall Street banks. Divest LA is a coalition of over 30 progressive, indigenous, environmental, and ethical banking organizations. The coalition’s aim is to embolden Los Angeles city officials and residents to divest from corporations that act against the common good, and reinvest funds towards socially and environmentally conscious institutions. Participating organizations include: Revolution LA, Indigenous Peoples Collective, Red Earth Defense, AIM SoCal, Alliance of Californians for Community Empowerment (ACCE), Committee for Better Banks, Fight Climate Denial, Climate Hawks Vote, Rainforest Action Network, 350 SoCal, 350.org.